Reviews Fat sound...Rollicking technique....Innovative interpretive panache.......This is the Eddie Daniels I know and love....The 'reedman extraordinaire' as it were. 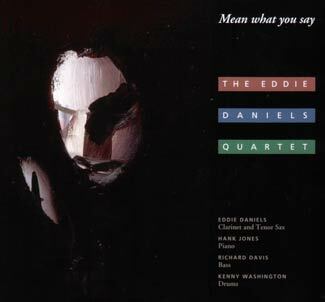 Plus, Eddie washes us with the great music of Thad Jones in performing the CD'S signature tune which Thad wrote......'Mean What I Say.' Thad's brother Hank in the piano seat for the project is another definite plus. And then Eddie, laying some of his superb tenor work on us as well says something for the imminent success of the disc, & where it's headed in the overall scheme of things. And might I suggest that where this CD is headed is under the lasers of countless CD players. This is damn good stuff!! This is the American Songbook with consummate class. Eddie remains the unique sounding reed player whose distinctive sound can cut through any blowing with subtle curves or whispered nuances. Eddie is destined to continue to make creative, centered, focused art for many more years to follow.